The Murray-Darling Basin Authority’s revised plan has state governments, irrigators and conservationists disagreeing over what is a ‘fair’ deal. over the future of the Murray-Darling Basin should be handled, all saying they want to see a fairer deal. The plan, released by the Murray-Darling Basin Authority on August 6, has proposed to return between 2400GL and 3200GL to the Murray-Darling River annually. However, South Australian Premier Jay Weatherill said the new plan fails to protect the state’s internationally recognised wetlands and unfairly burdens South Australians. The Premier said the upstream states have taken too much water and must return the water to the suffering river system. He has recently threatened a legal challenge if Parliament passes the current plan, while the Greens have refused to support the plan in its current form. The State Government wants between 3500GL and 4000GL of water returned to the river system to flush out the two million tonnes of salt that accumulates in the river each year. But Greens Senator Sarah Hanson-Young is pushing for a minimum of 4000GL to restore the river system to health so “all communities and environments across the Basin can flourish”. “The best available science tells us that the environmental targets can only be met by a minimum of 4000GL, although the ideal figure of water recovery would actually be 7600GL,” she said. During the drought, parts of the Coorong were five times saltier than the sea and parts of the Lower Lakes are still too salty for use as drinking water, irrigation or stock. In dry times, salt and pollutants in the river accumulate and start climbing back up the river system, with detrimental effects on water quality andharms species using the river. According to the Wentworth Group, to ensure the basin reaches two-thirds of its natural flow, the cap on diversions would need to be increased by more than 4000GL. “Without adequate flows to flush the system, the Lower Lakes and Coorong will collapse again and we will lose it for good this time,” Senator Hanson-Young said. However, the Australian Dairy Industry Council’s chair of the Basin response taskforce Daryl Hoey says a 4000GL target would have a “significant impact” on regions that rely on dairy and rural industries. Mr Hoey says rural Victoria alone would lose more than 6000 farming and direct industry support jobs, with more flow-on service jobs in small communities affected. Meanwhile, the Victorian and NSW governments say they would back a 2100GL return. “Rivers die from the bottom up and unless we get it right here in South Australia we are condemning the river to a slow death in years to come,” Senator Hanson-Young told Our World Today. 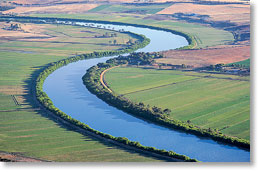 The Murray-Darling Basin provides more than one-third of Australia’s food supply, but in 2008 the Sustainable Rivers Audit rated the health of a majority ofriver valleys in the Murray River as “poor” or “very poor”. Mr Hoey says the Government should invest more money into on-farm works and water-saving infrastructure to achieve the desired environmental outcomes. “The problem with the plan from day one is that there are people pushing for higher numbers who see this as purely a gush of water down the river,” he said. The Murray-Darling Basin spans across parts of Queensland, New South Wales, ACT, Victoria and reaches the sea at Goolwa, South Australia. It is Australia’s largest river system and is regarded as Australia’s most important agricultural region. Parties involved have one week left to consult with the Federal Minister for Sustainability, Environment and Water Tony Burke before he officially decides to approve the plan in its current form or request further changes.